1 William A. Gladstone, Men of Color (Gettysburg, Pennsylvania: Thomas Publications, 1993), 6. 6 Joseph G. Bilby, Forgotten Warriors (Hightstown, New Jersey: Longstreet House, 1993), 7-18. 8 William A. Gladstone correspondence, February 9, 2009. 10 The New Jersey Mirror, June 21, 1855, 3. 11 Donald R. Shaffer, After The Glory/ The Struggles of Black Civil War Veterans (Lawrence, Kansas: University Press of Kansas, 2004), 121-133. 12 Joseph T. Glatthaar, Forged in Battle (Baton Rouge, Louisiana: Louisiana State University Press, 2000), 234. 13 Noah Andre Trudeau, Like Men of War (New York: Little, Brown and Company, 1998), 283; James M. Paradis, Strike The Blow For Freedom (Shippensburg, Pennsylvania: White Mane Books, 1998), 61. 14 John McMurray, Recollections of a Colored Troop (Brookville, Pennsylvania: privately printed, 1916), 45-47; Paradis, 61-68; Trudeau, 284. 15 Civil War Pension Files of John Johnson, Company B, Sixth U.S. Colored Infantry; Records of the Veterans Association, Record Group (RG) 15; National Archives Building (NAB), Washington, D.C.
16 Correspondence with Director of the National Museum of Civil War Medicine, Terry Reimer, February 19, 2009. 17 H. Scott Bjerke (M.D.,FACS), Amit Trevar (M.D. ), “Frostbite Overview”, eMedicine General Surgery/ Medscape, updated March 8, 2006, viewed 2/9/2009, http://emedicine.medscape.com/article/194957-overview, 2-3. 18 Sam R. Watkins, “Co. Aytch” (New York, New York: Collier Books, 1962), 31-34, 38. 20 According to the Civil War Compiled Military Records, William Sullivan was by July, 1864 appointed Corporal and was promoted to Sergeant on July 1, 1865. 21 Glenna R. Schroeder-Lein, The Encyclopedia of Civil War Medicine (Armonk, New York: M. E. Sharpe, 2008), 264, 265; correspondence with Director of the National Museum of Civil War Medicine, Terry Reimer, in May, 2008. 22 According to the Civil War Compiled Military Records, Private Charles Armstrong was inducted in as 1st Sergeant on December 24, 1864, reduced by General Order to Corporal on February 23, 1864, promoted by General Order to Sergeant on April 1, 1864, reduced from Sergeant to Private by General Order on June 1, 1864. 23 Charles Eckhardt and Robert MacAvoy, Our Brothers Gone Before Vol. 1(Hightstown, New Jersey: Longstreet House, 2006), 38. 25 (Department of the Interiors Bureau of Pensions) Pension Files of Ephraim Marshall, Company G, Twenty-second U.S. Colored Infantry; Records of the Veterans Association; (RG 15); (NAB); Washington, D.C.
26 Frank Moore, The Rebellion Record V8: A Diary Of American Events With Documents, Narratives, Illustrative Incidents, Poetry, Etc. ( No. 192 Broadway, New York: D. Van Nostrand, Publisher, 1865), 52. 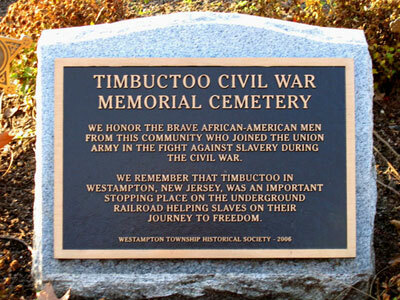 27 Correspondence with Joseph B. Bilby, May 21, 2008: In the Timbuctoo Civil War Soldier Pension Files, deposition and physician reports always referred to gunshot wounds as caused by “musket balls”. However, both round balls and rifle musket Minie balls tended to be classified as “musket balls.” At that time of the war, however, they would almost invariably have been Minie balls. Name mixups were not uncommon. 28 The New Jersey Mirror, June 21, 1855, 3. 29 Burlington County Courthouse, Deed Book E-6, pg. 256. 31 According to the Civil War Compiled Military Records, William Davis was promoted by General Order to Sergeant, February 23, 1864; reduced by General Order from Sergeant and appointed Corporal, May 1, 1864; reduced to Private, January 1, 1865. 33 William S. Stryker, Record Of Officers And Men In Civil War (1861-1865) Vol 2 (Trenton, New Jersey: John L. Murphy, Steam Book And Job Printer, 1876) 1514. 36 According to the Civil War Compiled Military Records, Edward Chapman was initially appointed a Sergeant and was reduced to Private on February 6, 1864. 37 Burlington County Herald, October 26, 1972, 1. 38 The New Jersey Mirror, June 14, 1855, 3. 39 According to the Civil War Compiled Military Records, Ephraim Marshall was appointed Corporal after he enlisted and was recognized as such in the Company Muster-in Roll on January 12, 1864. He was reduced from Corporal to Private on February 6, 1864. 40 James Still, Early Recollection And Life Of Dr. James Still (Kessinger Publishing of Rare Reprints/originally printed by author by J. B. Lippincott & Co., 1877), 30, 31. James Still, the famous Black Doctor of the Pines, was the brother of famous William Still, (abolitionist, historian, author of the Underground Railroad). When he was about 21 years old, James was bound out to farmer Amos Wilkins for three years. His father (Levin Still) was to receive one hundred dollars; James would acquire one month of schooling, each winter for each year with ten dollars at termination for a new suit. 41 Burlington County Herald, Sept 13, 1849, 3;Burlington County Herald, May 16, 1850, 1. 42 The New Jersey Mirror, September 13, 1855, 3. 43 William H. Leckie, The Buffalo Soldiers (Norman, Oklahoma: University of Oklahoma Press, 1967), 12, 13. 44 Leo W. Banks, “The Buffalo Soldiers”, Arizona Highway Magazine, January, (Vol. 71, No. 1), 1995: 36; Leckie, 14. 47 David Nevin, The Old West – the Soldiers (New York/ Canada: Time Inc. Time Life Series Books, 1974), 25. 49 Leckie, 16, 20, 21, 28, 33, 47. 50 Ibid., 15, 20, 46, 47. 51 Ibid., 15, 42, 51, 71, 72, 78. 57 J. M. Carroll, The Indian Wars Campaign Medal: Its History And Its Recipients (Mattituck, New York: J. M. Carroll & Company, 1992), 35, 51. 60 The New Jersey Mirror, September 13, 1855, p. 3.